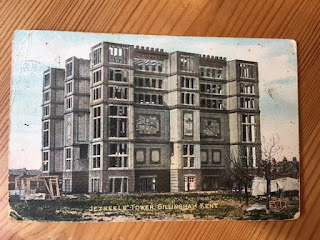 There was an earlier attempt on the tower, as detailed in 'The Jezreelites', by R.A. Baldwin, published by the Lambarde Press of Orpington in 1962. 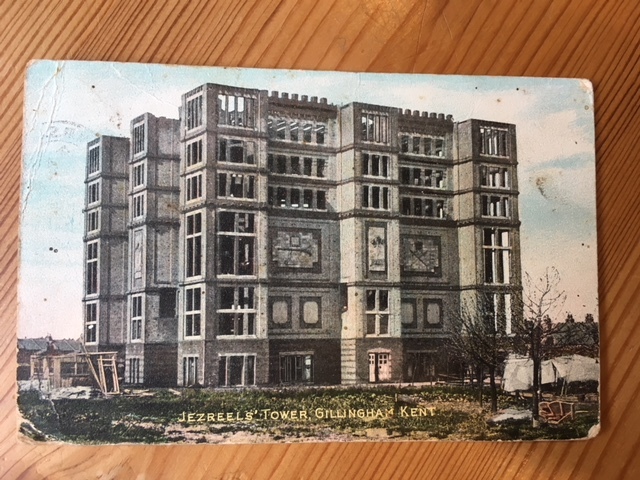 The tower was sold in August 1903 "to Messrs. Brodage, Ridley and Tanton, of Tonbridge", with the Jezreelite community remaining in residence. 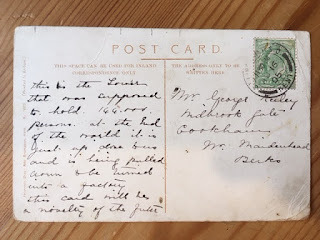 At mid-day on Friday, 29th July, 1905, under the owners' instructions, a broker and a party of navvies entered the premises, climbed the tower and commenced knocking bricks down to the ground, while other navvies took possession of the field." There follows a description of scuffles between the workers and the emerging Jezreelites, until the arrival of the police restored order. Irregular demolition of the tower continued for some time, hence its irregular appearance in later views - volume IV of 'Recording Britain', OUP / The Pilgrim Trust 1949, includes an atmospheric painting by Thomas Hennell showing its condition then. "It was never roofed and never used as a factory, and the reduction of its height was stopped, probably because the sale of bricks did not cover the demolition expenses". One of the Devil's Towers?